Infographics rely on high quality visual design in order to successfully convey your message and with business intelligence on the rise, there’s more and more content to visualize. This means that in order for your company’s graphics to stand out, you need to hit all the right factors. Design errors will stick out like a sore thumb. Before you start developing new visuals, learn the basics. 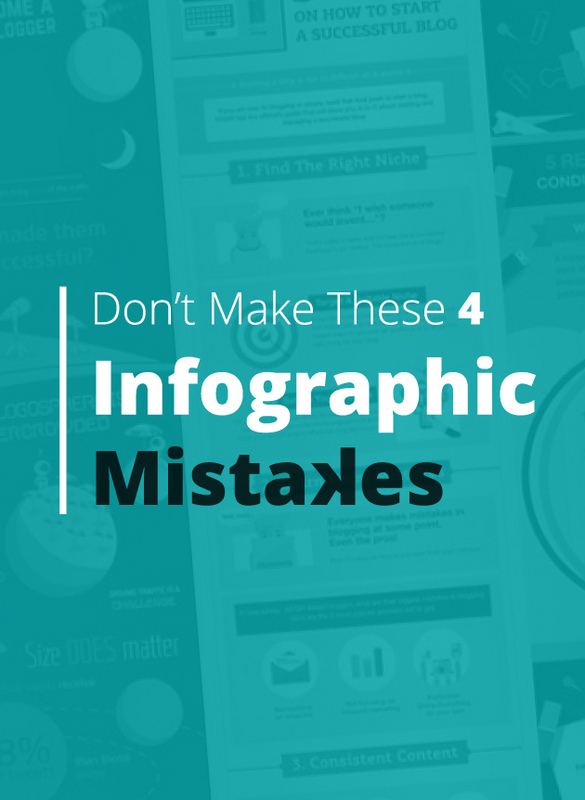 Here are 4 common design mistakes you need to avoid if you want your infographics to succeed. One of the most common infographic design flaws comes from a misunderstanding. Companies think that by adding some lines, boxes, and a color background, they can cram an unreasonable amount of text into a small space. 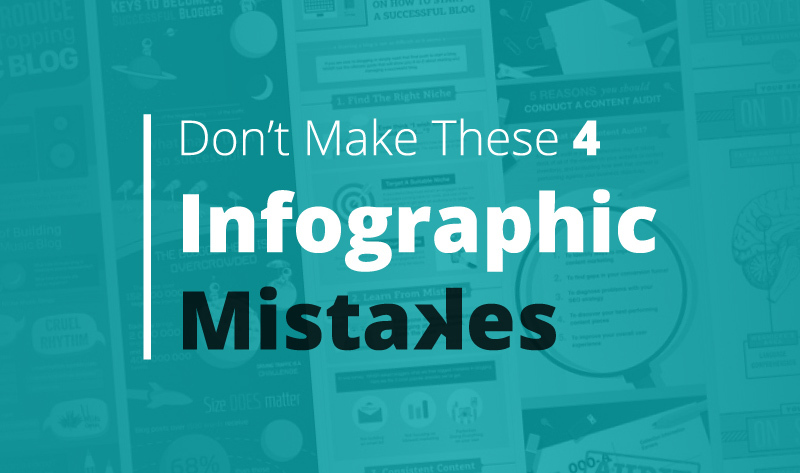 Putting too much information into an infographic makes it difficult to read and will steer people away in the same way that excessively long blog posts do. But to make it worse, too much text in an infographic is visually confusing and overwhelming. Instead, focus on key terms and statistics when assembling an infographic to get the most impact from the least content. Part of what makes infographics so great is that they’re flexible, allowing you to choose between many different design types to convey your message. Unfortunately, this flexibility can be a trap for those who don’t understand what kind of visual works best for a particular kind of data. And while it’s typically not catastrophic, choosing the wrong chart format can make your content more difficult to interpret. Pie charts in particular have a bad reputation in the infographic scene. Unless you’re dealing in percentiles or actual pie, steer clear of these. Even worse, never try to compare percentages using a non-uniform visual. A pie chart works because interpreting it only requires you to look at the angle of the slice. Abnormal shapes erase this function. Instead of just plugging content into a random chart, before designing an infographic, identify the category of information you’re working to communicate and research the best visualization strategy for that kind of content. You’ve put in all this time and energy designing an infographic, but you’ve forgotten the most important thing: to put your brand on it! This is a common design flaw, one that companies often justify by stating that the content is going on their personal blog. However, when you forget to brand content, even content on your own blog, you leave the door open for other companies to use your graphic without giving you credit. People reuse online content all the time. Don’t let your hard work be co-opted by another company because you forgot to add a logo or copyright information. Make it clear that this graphic belongs to you. Many of the differences between successful infographics are erased if you hold their sharing platform as a constant. Different platforms favor different formats. You can put more words on an infographic for LinkedIn, for example, than you can on one for Pinterest or Facebook, with a 100 word difference between successful Facebook infographics and successful LinkedIn ones. Knowing your audience will also help you determine how much context you need to provide, how formal your infographic should be, and other important factors. You need to design with the target in mind, rather than creating an infographic and sending it out arbitrarily into the world. A skillfully made infographic can grab a lot of attention, so design with care. Learn the trade by studying successful infographics from other companies, looking at different social networks for variation, and considering what kinds of information matter to readers. The infographic is a populist format unlike an annual report, and remembering that can make a big difference in your design approach.